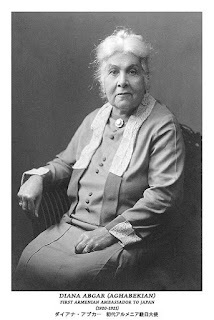 Writer, humanitarian, ambassador, activist and Armenian, Diana Apcar was born in British Burma in 1859. She grew up in India and eventually settled in Japan after marrying Apcar Michael Apcar. Her husband died in 1906, after which she took over their family business. Diana was not born in Ottoman Turkey and never lived there, but she deeply cared about the plight of the Armenians living there. In 1909, Diana learned of the massacre of Armenians at Adana, and she knew she had to act. She published a book in 1910 titled Betrayed Armenia: These are They Which Came Out of Great Tribulation and quickly followed this with texts on peace and evil. She also wrote many pamphlets and articles, as well as letters to foreign leaders asking for help and change. She also worked with refugees who found their way to Japan. She self-funded refugee houses where she paid for the food, clothing, lodging and health care of the residents who could not afford to pay for these things themselves. She also helped them get the proper paperwork to travel to America. On May 28, 1918, in spite of the horrors of the previous few years, the Republic of Armenia gained independence. Unfortunately, it was not recognized by any other countries. Diana fought to change this. She became an honorary diplomat to Japan. She was the first Armenian woman to hold this kind of post. She may have even been the first woman ever to carry such an honor. Eventually, she won over the support Japan, which acknowledged Armenia as a country and was one of the few countries to do so. The diplomatic post also afforded Diana the opportunity to help refugees more and allowed her a better platform for contacting world leaders about the issues facing the Armenian people. Diana's position was abolished in 1921 when Armenia became a part of the Soviet Union, but in the time she worked as an ambassador, she made a huge impact for refugees as well as international Armenian relations. She passed away in 1937 in Japan at the age of 77. Relentless, Diana worked to bring worldwide awareness to the ongoing oppression of Armenians. She started writing about the problems that faced Armenians six years before what is thought of as the main period of the Armenian genocide. Diana could have seen living in Japan, separate from her people, as something that disconnected her from the suffering Armenians, but instead, she used the safety of her distance to tell the world what was happening. Diana did not conform to traditional roles for women at the time. She ran a business, was highly educated and held a political position in an era where most women, even those in the developed nations, couldn't vote. This one Armenian woman, with no help from an embassy, fought for a small nation of people who had no country to call home, and she made an impact. Diana's story hasn't been noticed by history yet, but she deserves a prominent place among the stories we tell about the past. Many accounts of survival shared by Armenian refugees who came through Japan described Diana's help and her kindness. She was just one woman at a time when being a woman didn't afford one many opportunities, but she didn't let barriers get in the way of the love she had for her people. Read more about Diana as told by her descendants.